O God, who by the preaching of blessed Paul the Apostle, didst instruct the multitude of the Gentiles: grant, we beseech thee, that whilst we celebrate his memory, we may find the effects of his prayers. Through our Lord Jesus Christ, thy Son, who liveth and reigneth with thee, in the unity of the Holy Ghost, God, world without end. Amen. (Commemoration of St. Peter) O God, who by delivering to the blessed Apostle Peter the keys of the kingdom of heaven, didst give him the power of binding and loosing: grant, that by his intercession, we may be freed from the bonds of our sins. Who livest, and resignest, world without end. Amen. And like the sun, love only reigns. For an eternity of days. Amen. ℟. The preacher of the truth thro’ the whole world. We have already seen how the Gentiles, in the person of the Three Magi, offered their mystic gifts to the Divine Child of Bethlehem, and received from him, in return, the precious gifts of faith, hope, and charity. The harvest is ripe; it is time for the reaper to come. But, who is to be God's labourer? The Apostles of Christ are still living under the very shadow of mount Sion. All of them have received the mission to preach the gospel of salvation to the uttermost parts of the world; but not one among them has, as yet, received the special character of Apostle of the Gentiles. Peter, who had received the Apostleship of Circumcision (Gal, ii. 8), is sent specially, as was Christ himself, to the sheep that are lost of the house of Israel (St. Matth, xv. 24), And yet, as he is the Head and the Foundation, it belongs to him to open the door of Faith to the Gentiles (Acts, xiv. 26); which he solemnly does, by conferring Baptism on Cornelius, the Roman Centurion. But the Church is to have one more Apostle—an Apostle for the Gentiles—and he is to be the fruit of the martyrdom and prayer of St. Stephen. Saul, a citizen of Tarsus, has not seen Christ in the flesh, and yet Christ alone can make an Apostle. It is, then, from heaven, where he reigns impassible and glorified, that Jesus will call Saul to be his disciple, just as, during the period of his active life, he called the fishermen of Genesareth to follow him and hearken to his teachings. The Son of God will raise Saul up to the third heaven, and there will reveal to him all his mysteries: and when Saul, having come down again to this earth, shall have seen Peter (Gal, i. 18), and compared his Gospel with that recognised by Peter (Gal, ii. 2)—he can say, in all truth, that he is an Apostle of Christ Jesus (Gal, i. 1), and that he has done nothing less than the great Apostles (II Cor, xi. 5). It is on this glorious day of the Conversion of Saul, who is soon to change his name into Paul, that this great work is commenced. It is on this day, that is heard the Almighty voice which breaketh the cedars of Libanus (Ps, xxviii. 5), and can make a persecuting Jew become first a Christian, and then an Apostle. This admirable transformation had been prophesied by Jacob, when, upon his death-bed, he unfolded, to each of his sons, the future of the tribe of which he was to be the father. Juda was to have the precedence of honour; from his royal race, was to be born the Redeemer, the Expected of nations. Benjamin's turn came; his glory is not to be compared with that of his brother Juda, and yet it was to be very great—for, from his tribe, is to be born Paul, the Apostle of the Gentile nations. These are the words of the dying Prophet: Benjamin, a ravenous wolf, in the morning shall eat the prey, and in the evening shall divide the spoil (Gen, xlix. 27). Who, says an ancient writer, is he, that in the morning of impetuous youth, goes like a wolf, in pursuit of the sheep of Christ, breathing threatenings and slaughter against them? Is it not Saul on the road to Damascus, the bearer and doer of the high-priest's orders, and stained with the blood of Stephen, whom he has stoned by the hands of all those, over whose garments he kept watch? And he, who, in the evening, not only does not despoil, but, with a charitable and peaceful hand, breaks to the hungry the bread of life—is it not Paul, of the tribe of Benjamin, the Apostle of Christ, burning with zeal for his brethren, making himself all to all, and wishing even to be an anathema for their sakes? Oh! the power of our dear Jesus! how wonderful! how irresistible! He wishes that the first worshippers at his Crib should be humble Shepherds—and he invites them by his Angels, whose sweet hymn was enough to lead these simple-hearted men to the Stable, where lies, in swaddling-clothes, He who is the hope of Israel. He would have the Gentile Princes, the Magi, do him homage—and bids to arise in the heavens a Star, whose mysterious apparition, joined to the interior speaking of the Holy Ghost, induces these men of desire to come from the far East, and lay, at the feet of an humble Babe, their riches and their hearts. When the time is come for forming the Apostolic College, he approaches the banks of the sea of Tiberias, and with this single word: Follow me, he draws after him such as he wishes to have as his Disciples. In the midst of all the humiliations of his Passion, he has but to look at the unfaithful Peter, and Peter is a penitent. 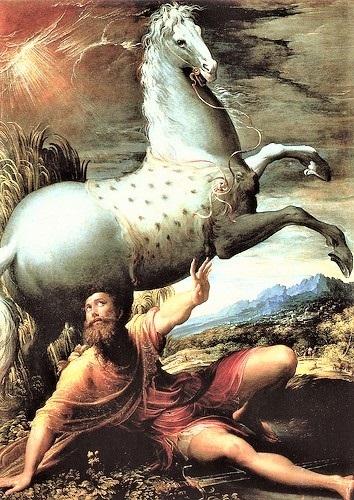 To-day, it is from heaven that he evinces his power: all the mysteries of our redemption have been accomplished, and he wishes to show mankind, that he is the sole author and master of the Apostolate, and that his alliance with the Gentiles is now perfect:—he speaks; the sound of his reproach bursts like thunder over the head of this hot Pharisee, who is bent on annihilating the Church; he takes this heart of the Jew, and, by his grace, turns it into the heart of the Apostle, the Vessel of election, the Paul who is afterwards to say of himself: I live, not I, but Christ liveth in me (Gal, ii. 20). The commemoration of this great event was to be a Feast in the Church, and it had a right to be kept as near as might be to the one which celebrates the martyrdom of St. Stephen, for Paul is the Protomartyr's convert. The anniversary of his martyrdom would, of course, have to be solemnised at the summer-solstice; where, then, place the Feast of his Conversion if not near Christmas, and thus our own Apostle would be at Jesus' Crib, and Stephen's side? Moreover, the Magi could claim him, as being the conqueror of that Gentile-world, of which they were the first-fruits. And lastly, it was necessary, in order to give the court of our Infant-King its full beauty, that the two Princes of the Church—the Apostle of the Jews, and the Apostle of the Gentiles—should stand close to the mystic Crib; Peter, with his Keys, and Paul, with his Sword. Bethlehem thus becomes the perfect figure of the Church, and the riches of this season of the Cycle are abundant beyond measure. This great apostle was a Jew, of the tribe of Benjamin. At his circumcision, on the eighth day after his birth, he received the name of Saul. His father was by sect a Pharisee, and a denizen of Tarsus, the capital of Cilicia: which city had shown a particular regard for the cause of the Cӕsars; on which account Cassius deprived it of its privileges and lands; but Augustus, when conqueror, made it ample amends by honoring it with many new privileges, and with the freedom of Rome, as we read in the two Dions and Appian. Hence St. Paul, being born at Tarsus, was by privilege a Roman citizen, to which quality a great distinction and several exemptions were granted by the laws of the empire (Acts, xxi. 29; xxii. 3). His parents sent him young to Jerusalem, where he was educated and instructed in the strictest observance of the law of Moses, by Gamaliel (Acts, xxii. 3), a learned and noble Jew, and probably a member of the Sanhedrim; and was a most scrupulous observer of it in every point. He appeals even to his enemies to bear evidence how conformable to it his life had been in every respect (Acts, xxvi. 4). He embraced the sect of the Pharisees, which was of all others the most severe, though by its pride the most opposite to the humility of the gospel (Acts, xxvi. 5). It was a rule among the Jews that all their children were to learn some trade with their studies, were it but to avoid idleness, and to exercise the body, as well as the mind, in something serious. It is therefore probable that Saul learned in his youth the trade which he exercised even after his apostleship, of making tents. After the martyrdom of the holy deacon, the priests and magistrates of the Jews raised a violent persecution against the church at Jerusalem, in which Saul signalized himself above others. By virtue of the power he had received from the high priest, he dragged the Christians out of their houses, loaded them with chains, and thrust them into prison (Acts, viii. 3; xxii. 4; xxvi. 10). He procured them to be scourged in the synagogues, and endeavored by torments to compel them to blaspheme the name of Christ. And as our Saviour had always been represented by the leading men of the Jews as an enemy to their law, it was no wonder that this rigorous Pharisee fully persuaded himself that he ought to do many things contrary to the name of Jesus of Nazareth (Acts, xxvi. 9). By the violences he committed, his name became everywhere a terror to the faithful. The persecutors not only raged against their persons, but also seized their estates and what they possessed in common (Heb, x. 32), and left them in such extreme necessity, that the remotest churches afterwards thought it incumbent on them to join in charitable contributions to their relief. All this could not satisfy the fury of Saul; he breathed nothing but threats and the slaughter of the other disciples (Acts, x. 1). Wherefore, in the fury of his zeal, he applied to the high priest and Sanhedrim for a commission to take up all Jews at Damascus who confessed Jesus Christ, and bring them bound to Jerusalem, that they might serve as public examples for the terror of others. But God was pleased to show forth in him his patience and mercy; and, moved by the prayers of St. Stephen and his other persecuted servants, for their enemies, changed him, in the very heat of his fury, into a vessel of election, and made him a greater man in his church by the grace of the apostleship, than St. Stephen had ever been, and a more illustrious instrument of his glory. He was almost at the end of his journey to Damascus, when, about noon, he and his company were on a sudden surrounded by a great light from heaven, brighter than the sun (Acts, ix, xxii, xxvi). They all saw the light, and being struck with amazement, fell to the ground. Then Saul heard a voice, which to him was articulate and distinct; but not understood, though heard by the rest: Saul, Saul, why dost thou persecute me? Christ said not: Why dost thou persecute my disciples? but me: for it is he, their head, who is chiefly persecuted in his servants. Saul answered: Who art thou, Lord? Christ said: Jesus of Nazareth, whom thou persecutest. It is hard for thee to kick against the goad: “to contend with one so much mightier than thyself. By persecuting my church you make it flourish, and only prick and hurt yourself.” This mild expostulation of our Redeemer, accompanied with a powerful interior grace, strongly affecting his soul, cured his pride, assuaged his rage, and wrought at once a total change in him. Wherefore, trembling and astonished, he cried out: Lord, what wilt thou have me to do? What to repair the past! What to promote your glory? I make a joyful oblation of myself to execute your will in every thing, and to suffer for your sake afflictions, disgraces, persecutions, torments, and every sort of death. The true convert expressed this, not in a bare form of words, nor with faint languid desires, nor with any exception lurking in the secret recesses of his heart; but with an entire sacrifice of himself, and an heroic victory over the world with its frowns and charms, over the devils with their snares and threats, and over himself and all inclinations of self-love; devoting himself totally to God. A perfect model of a true conversion, the greatest work of almighty grace! Christ ordered him to arise and proceed on his journey to the city, where he should be informed of what he expected from him. Christ would not instruct him immediately by himself, but, St. Austin observes, sent him to the ministry which he had established in the church, to be directed in the way of salvation by those whom he had appointed for that purpose. He would not finish the conversion and instruction of this great apostle, whom he was pleased to call in so wonderful a manner, but by remitting him to the guidance of his ministers; showing us thereby that his holy providence has so ordered it, that all who desire to serve him, should seek his will by listening to those whom he has commanded us to hear, and whom he has sent in his own name and appointed to be our guides. So perfectly would he abolish in his servants all self-confidence and presumption, the source of error and illusion. The convert, rising from the ground, found that, though his eyes were open, he saw nothing. Providence sent this corporal blindness to be an emblem of the spiritual blindness in which he had lived, and to signify to him that he was henceforward to die to the world, and learn to apply his mind totally to the contemplation of heavenly things. He was led by the hand into Damascus, whither Christ seemed to conduct him in triumph. He was lodged in the house of a Jew named Judas, where he remained three days blind, and without eating or drinking. He doubtless spent his time in great bitterness of soul, not yet knowing what God required of him. With what anguish he bewailed his past blindness and false zeal against the church, we may conjecture both from his taking no nourishment during those three days, and from the manner in which he ever after remembered and spoke of his having been a blasphemer and a persecutor. Though the entire reformation of his heart was not gradual, as in ordinary conversions, but miraculous in the order of grace, and perfect in a moment; yet a time of probation and a severe interior trial (for such we cannot doubt but he went through on this occasion) was necessary to crucify the old man and all other earthly sentiments in his heart, and to prepare it to receive the extraordinary graces which God designed him. There was a Christian of distinction in Damascus, much respected by the Jews for his irreproachable life and great virtue; his name was Ananias. Christ appeared to this holy disciple, and commanded him to go to Saul, who was then in the house of Judas at prayer: Ananias trembled at the name of Saul, being no stranger to the mischief he had done in Jerusalem, or to the errand on which he was set out to Damascus. But our Redeemer overruled his fears, and charged him a second time to go to him, saying: Go, for he is a vessel of election to carry my name before Gentiles and kings, and the children of Israel; and I will show him how much he has to suffer for my name. For tribulation is the test and portion of all the true servants of Christ. Saul in the mean time saw in a vision a man entering, and laying his hands upon him, to restore his sight. Ananias, obeying the divine order, arose, went to Saul, and laying his hands upon him, said: Brother Saul, the Lord Jesus who appeared to thee on thy journey, hath sent me that thou mayest receive thy sight, and be filled with the Holy Ghost. Immediately something like scales fell from his eyes, and he recovered his eyesight. Ananias added: The God of our fathers hath chosen thee that thou shouldst know his will and see the just one, and shouldst hear the voice from his mouth: and thou shalt be his witness unto all men to publish what thou hast seen and heard. Arise, therefore, be baptized and washed from thy sins, invoking the name of the Lord. Saul then arose, was baptized, and took some refreshment. He stayed some few days with the disciples at Damascus, and began immediately to preach in the synagogues, that Jesus was the Son of God, to the great astonishment of all that heard him, who said: Is not this he who persecuted at Jerusalem those who invoked the name of Jesus, and who is come hither to carry them away prisoners? Thus a blasphemer and a persecutor was made an apostle, and chosen to be one of the principal instruments of God in the conversion of the world. St. Paul never recalled to mind this his wonderful conversion, without raptures of gratitude and praise to the divine mercy. The church, in thanksgiving to God for such a miracle of his grace, from which it has derived such great blessings, and to commemorate so miraculous an instance of his almighty power, and to propose to penitents a perfect model of a true conversion, has instituted this festival, which we find mentioned in several calendars and missals of the eighth and ninth centuries, and which pope Innocent III commanded to be observed with great solemnity. It was for some time kept a holy day of obligation in most churches in the West; and we read it mentioned as such in England in the council of Oxford in 1222, in the reign of king Henry III.